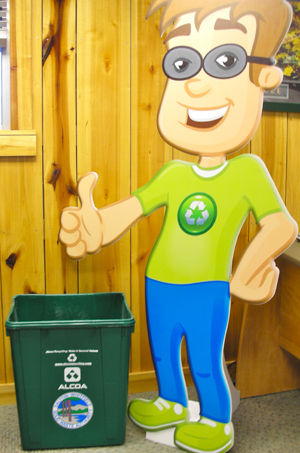 Thank you for your interest in receiving a free recycling bin through our program Recycling Ben's Bins. There was a limited supply of 100 bins available for this month and we have exhausted the supply. The Recycling Ben's Bins program is now closed and no longer accepting registrations. Please take a moment to subscribe to the Dalton-Whitfield Solid Waste Authority's e-mail newsletter to be notified of when another recycling bin giveaway will take place. If you recycle or are interested in recycling at the Convenience Centers download the Recycling Guide for Whitfield County called "Stop Treating Us Like Garbage". Keep in mind that recycling bins can take many forms, from repurposed trash cans, generic plastic bins, to reusable shopping bags and used cardboard boxes. We encourage you to separate your recyclables and drop them off at a Convenience Center near you. Recycling does make a difference. DALTON, GA – Recycling Ben is giving away a limited number of 22-gallon recycling bins to qualifying residents in Whitfield County through a new program called Recycling Ben’s Bins [ Registration for this program is now closed. ]. One hundred recycling bins were obtained through a grant awarded by ALCOA and the Georgia Recycling Coalition (GRC) and for use at one of four Convenience Centers managed by the Dalton-Whitfield Solid Waste Authority. Convenience Center locationsinclude the Old Dixie Landfill & Convenience Center in the south end of the county, Westside in Rocky Face, McGaughey Chapel in Cohutta, and M.L.King Blvd. in Dalton. Each one features a recycling and household garbage drop-off area among other services. Those interested in obtaining a free recycling bin through Recycling Ben’s Bins [ Registration for this program is now closed. ] should register online at www.DWSWA.org. Participants should already use a Convenience Center location to drop-off their household garbage or recyclables, have Internet access, a valid email address, and commit to answering a short recycling survey online once a month for one year to help gauge the impact of the grant. Each recycling bin includes a recycling guide, which details the types of materials accepted and how to prepare them for recycling. Those new to recycling are especially encouraged to register to obtain one of the remaining bins. To register for Recycling Ben’s Bins visit visit www.DWSWA.org. For recycling information contact Liz Swafford, Recycling and Education Program Coordinator, at 706-278-5001 or e-mail: lswafford@dwswa.org.